I hope you all had a wonderful Fourth of July with tons of fireworks, I know I did! It’s so beautiful to look at but it makes the loudest noise and creates such a scare with it goes off, nevertheless its still fun to play with fireworks! This fancy named dish was made because I really wanted to make something special for my family since we went through a lot sweat and work to put on a large event. Plus, I had half and half just sitting in my refrigerator. I found this recipe in a dessert cookbook from Williams-Sonoma. I haven’t made this in a while, so I totally forgot if I did something wrong or it was the recipes fault because It was not right when I first made it, the custard/crème was still very jiggly when it came out of the oven. Does not mean you cannot eat it, the dessert will be more like a creme caramel. I admit it might be my fault since the recipe tells you to pour the mixture through a sieve and for some reason I forgot about it and maybe half and half is not the right dairy to use. This recipe will have to be revisited another time. Ah ha! I do remember that I definitely need to lower the sugar amount (the recipe below has the changed amount) cause I think this might give someone a head start into diabetes and never to use brown sugar for the sugary tops to be brûléed because it will be turned into a blackened mess and you will be sad…I know I was. Getting the ramekins ready in a roasting pan. Pour the hot cream into the egg mixture. 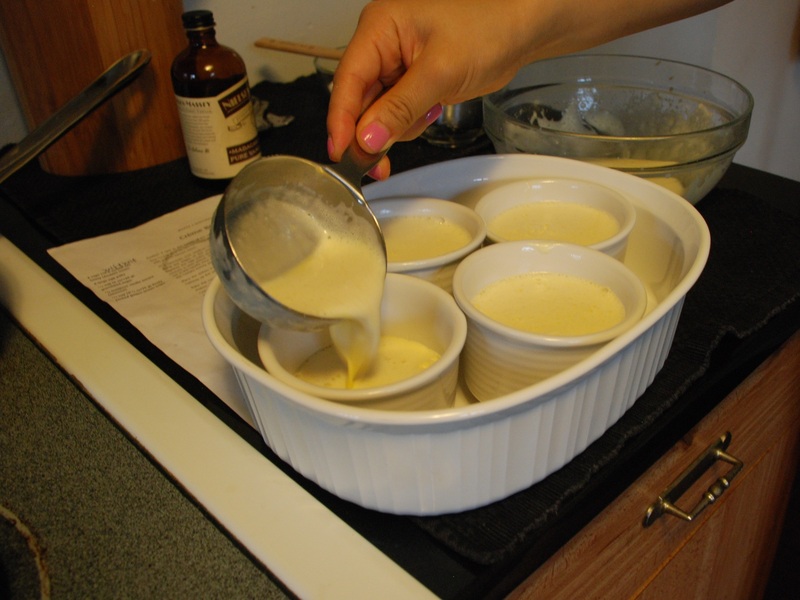 Evenly pour the custard in each ramekin. I used a broiler to burn the sugar since I couldn’t find the torch. In a 2-quart saucepan add the cream, stir to mix and set the pan over medium-low heat. Warm the cream until bubbles form around the edges of the pan and steam begins to rise from the surface. Remove from the heat and set aside for about 15 minutes. 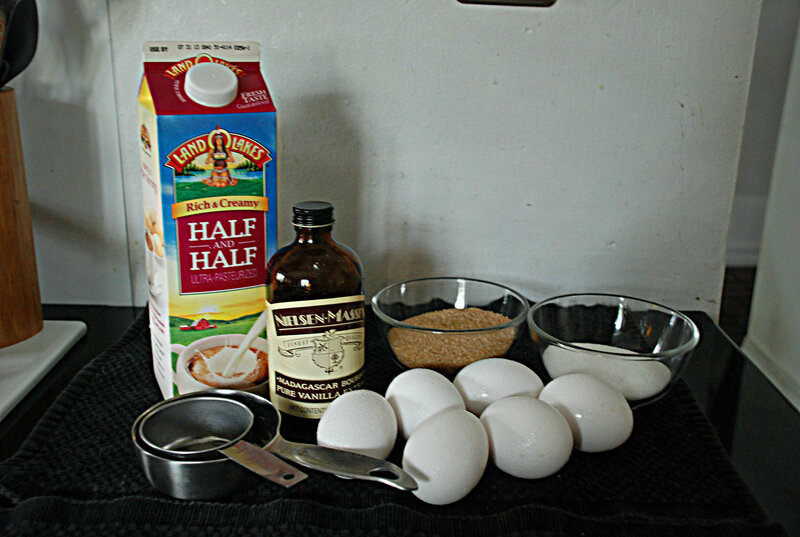 In a large bowl, whisk together the egg yolks and the 1/4 cup sugar until smooth, blended and mixture is pale yellow. 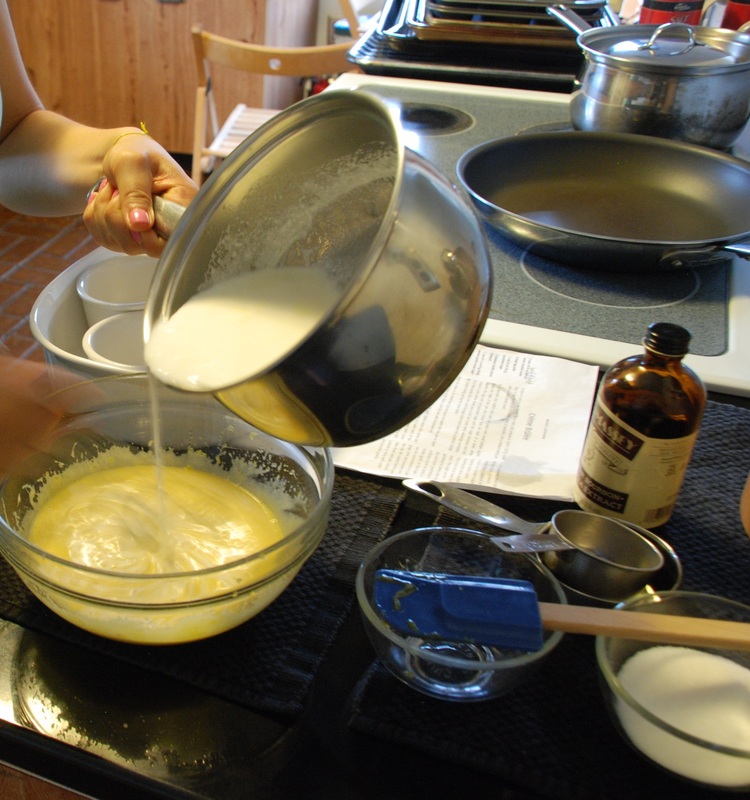 Gradually add the cream to the egg mixture, whisking constantly until blended. Stir in the vanilla extract. Pour the custard through a fine-mesh sieve set over a bowl. 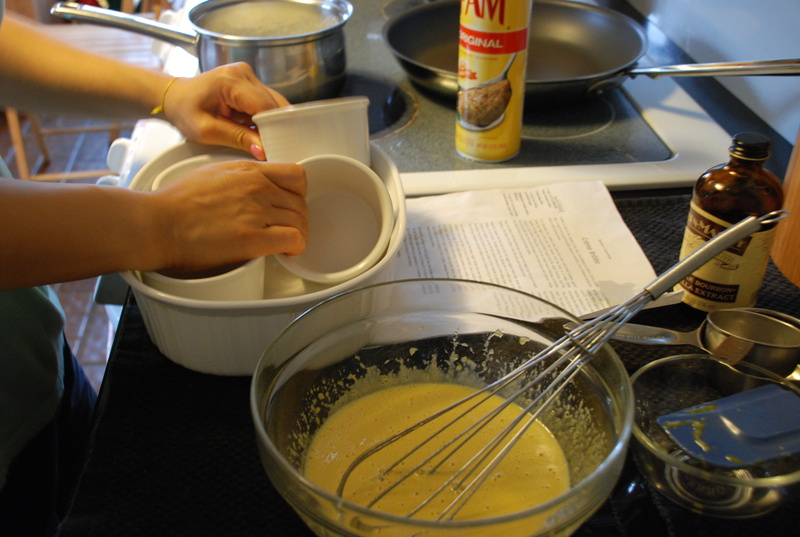 Divide the custard among four 5- or 6-oz. ramekins and place the ramekins in the prepared baking pan. Add boiling water to fill the pan halfway up the sides of the ramekins. Cover the pan loosely with aluminum foil and bake until the custard is just set around the edges, 35 to 40 minutes. 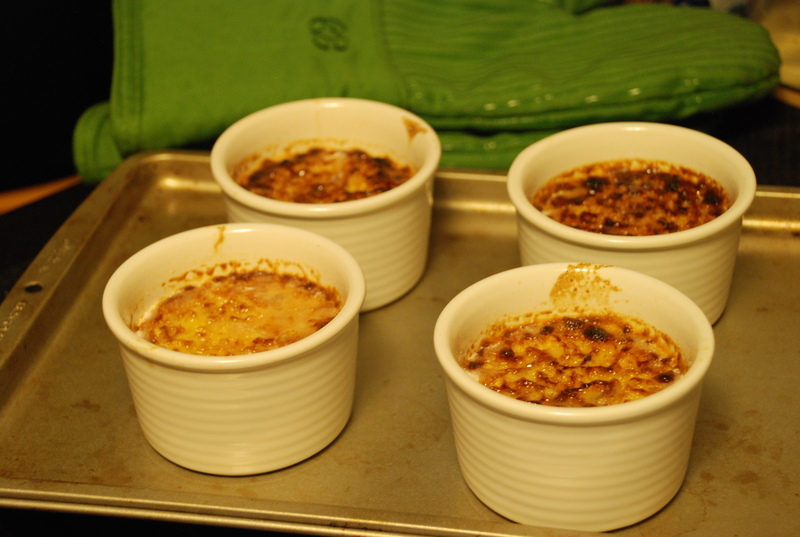 Transfer the ramekins to a wire rack and let cool to room temperature. Cover with plastic wrap and refrigerate for at least 4 hours or up to 3 days. Just before serving, sprinkle 1 Tbs. of the sugar evenly over each custard. Using a kitchen torch or the broiler melt the sugar evenly and golden brown. If you are using the broiler, place the ramekins on a baking sheet and place 2-3 inches from the heat source, watch constantly and rotate baking sheet to brown evenly. Happy Birthday Mom! Banana bread with chocolate. Wishing my mother a Happy Birthday and Hello July! Poor bananas. In my house they either get eaten quickly or slowly, or I forget them in the brown bag because I am waiting for them to ripen (It really works, just put an apple inside too). 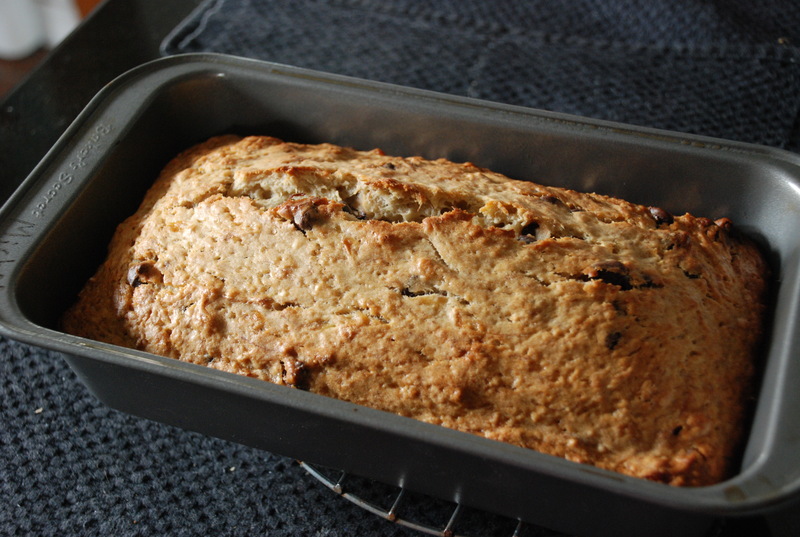 This time it was because the bananas were being eaten slowly, so slow that I had to put them in the refrigerator, but lovely for me to make banana bread! This recipe came from her book A Homemade Life, which has quite a few recipes with a great story behind each one. The butter and flour can be substituted for a healthier option. The banana and yogurt in the recipe can substitute the butter. Bananas can substitute the full amount of butter or, if you are skeptical, half the amount and the yogurt can substitute half the amount. 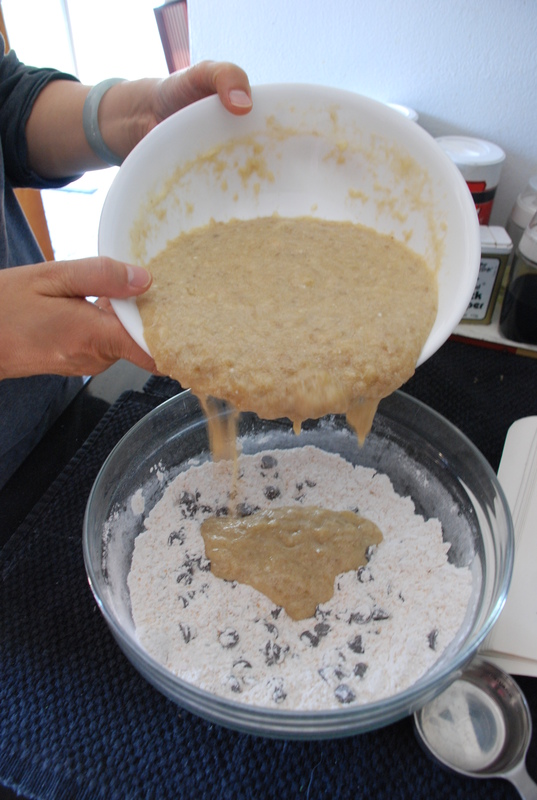 As for the flour, get yourself some ground flax seed and substitute about half or quarter the amount. This substitution can be put into use with just about any recipe. Another nifty tip, when you don’t have any baking soda just use double the amount of baking powder. mushy bananas, not a very appealing color. Pouring the mushy banana mixture into the dry ingredients. again not the most appealing color or action for that matter..oops. poured out the batter into the greased loaf pan and smoothed the top of the batter as best I could. Then out of the oven and the loaf has turned a beautiful golden brown. It smelled delicious! I had to restrain myself from eating it because I had to save it for a family gather the next day. In a small bowl, microwave the butter until just melted. (Be careful and do this over medium power in short burst because it can explode or splatter and that is a big mess.) Or melt it in the preheating oven. Set aside to cool slightly. 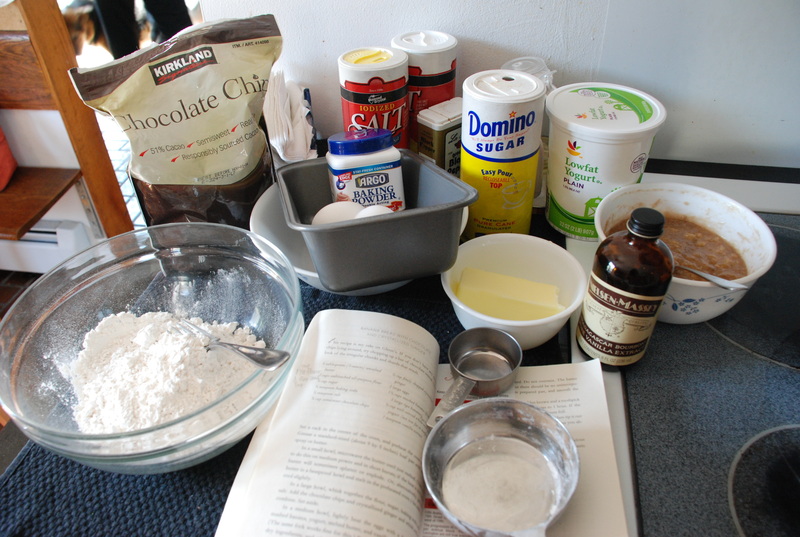 In a large bowl, whisk together the flour, sugar, baking soda, and salt. Add the chocolate chips and whisk well to combine. Set aside. In a medium bowl, lightly beat the eggs with a fork. Add the mashed banana, yogurt, melted butter, and vanilla and stir to mix well. Pour the banana mixture into the dry ingredients, and stir gently with a rubber spatula, scraping down the sides as needed, until just combined. Do not over mix. 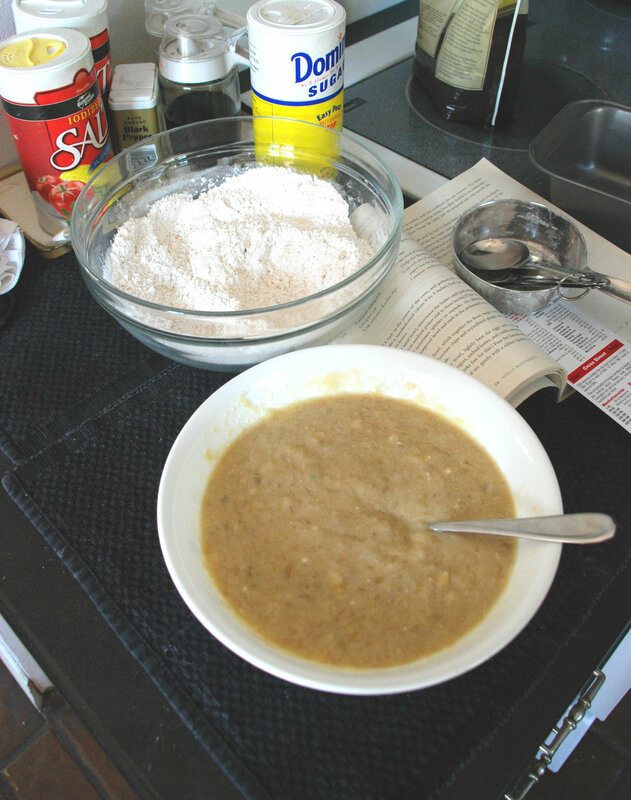 The batter with be thick and somewhat lumpy, just make sure all the flour has been incorporated. 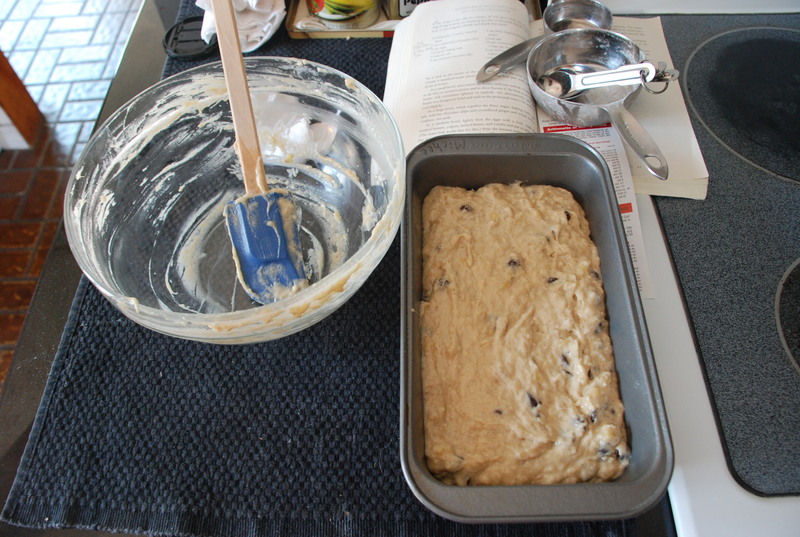 Scrape the batter into the loaf pan and smooth the top. Bake until the loaf is a deep shade of golden brown and a toothpick inserted into the center comes out clean, 50 mins to an hour. If the loaf seems to be browning too quickly, tent with foil. Cool the loaf in the pan on a wire rack for 5 mins. Then tip out onto the rack, and let it cool completely before slicing (if you can wait that long). The loaf freezes well wrapped in plastic wrap and again in foil to protect from freezer burn.